Assistive technology (AT) implementation can often be overlooked once teams have determined the best AT support or device to meet a student's learning needs. This page includes links to lesson activities, plans and demonstrations of evidence-based practices of AT implementations. The QIAT consortium provides many resources regarding implementation to help special education professionals plan and implement AT. The indicators for AT implementation are listed below with some evidence of each indicator described to help teams plan AT implementation. Additionally, the QIAT resource bank includes lesson plans and templates to help teams get started. The QIAT, Quality Indicators for Assistive Technology, includes seven indicators for AT implementation. On the QIAT website, educational teams can access rubrics to use to evaluate implementation, assessment, professional development, and many more. See QIAT Indicator Rubrics here. 1. AT implementation proceeds according to a collaboratively developed plan. 2. AT is integrated into the curriculum and daily activities of the student across environments. 3. Persons supporting the student across all environments in which the AT is expected to be used share responsibility for implementation of the plan. 4. Persons supporting the student provide opportunities for the student to use a variety of strategies–including AT–and to learn which strategies are most effective for particular circumstances and tasks. 5. Training for the student, family and staff is an integral part of implementation. 6. AT implementation is initially based on assessment data and is adjusted based on performance data. 7. AT implementation includes management and maintenance of equipment and materials. In each area, the QIAT indicator matrix lists evidence that these criteria have been met in an AT implementation. When looking at the indicators, plans that have shared responsibility for AT, include parent collaboration, infuse AT throughout the school day, and plan for ongoing staff, student and family training are on the road to effective AT implementations. 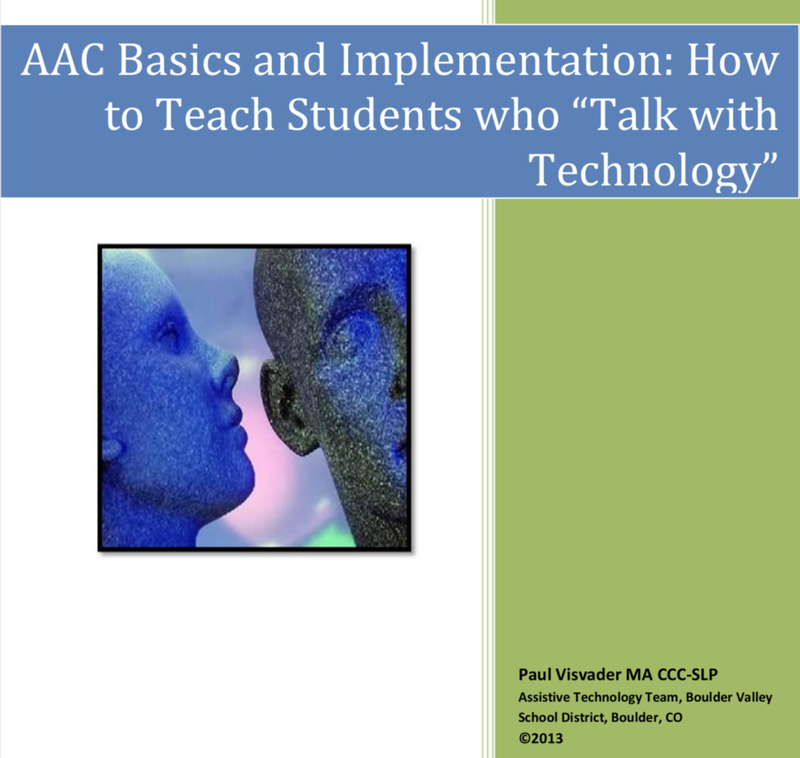 AAC Basics and Implementation: How to Teach Students who "Talk with Technology"
Karen Erickson's literacy and communication research is the cornerstone of the DLM instructional resources. Special Education Teams can obtain literacy templates, shared reading and writing lesson plans, and much more using the DLM Professional Development site. The DLM has many rich instructional resources to help special education teams plan and implement communication, literacy and math instruction for students with complex communication needs and/or multiple disabilities.